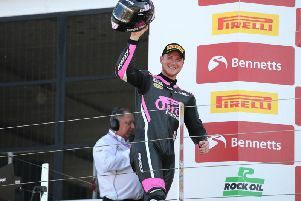 The Technical Director appointed by ACU Events Ltd at the Isle of Man TT has apologised to Ian Hutchinson for any confusion caused in the aftermath of his victory in the second Monster Energy Supersport race. A question was raised concerning the size of the pistons used in Hutchinson’s Team Traction Control Yamaha R6, although the parts were later confirmed as eligible. A statement issued by the organisers on Monday evening on behalf of Technical Director Adrian Gorst said: “I made an initial comment in the heat of the moment during post race inspection but on closer examination and after reviewing the TT regulations it became clear that the piston was eligible and complied with the Technical Regulations for the Supersport Class.